I thought I would share with you this little project I made for a friend's birthday. I've already posted her card, this is the gift to go with it. Although I do it less than cards, I also enjoy making jewelry and have quite the collection of beads. 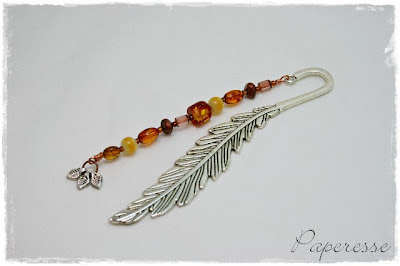 I chose some autumn colors to go with this leaf bookmark base and strung them on copper beading wire with three little leaf charms at the end. In keeping with the autumn leaf theme, I made up this little pillow gift box. I have a Rayher plastic template I use all the time to cut these. It makes it so easy and you can vary the length as you need. I admit that I'm not real picky about my paper. Sometimes it's the most basic paper I like the best. Nor do I worry about it being acid free and the like (unless it's for a photo album, then I do) as I don't expect it to last forever. I found several packages of these dividers at my favorite thrift store. They were all in neutral colors and at a give-a-way price, something like .30 centimes. I used an Existenci leaf stencil and sponged the leaf pattern on the paper. First with Distress Orange Marmalade, then a little Fired Brick. Next I cut the Rayher template and folded and glued the box. I used a Toga leaf die, cut the leaves in my Happycut and inked those too. I added some ribbon, a button and used some of my recent flea market twine find. I used a punch for the tag, wrote my friend's name and voila! . 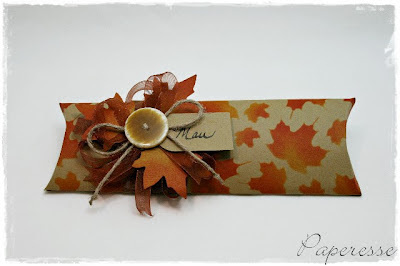 . . a lovely fall gift box for just a few cents. 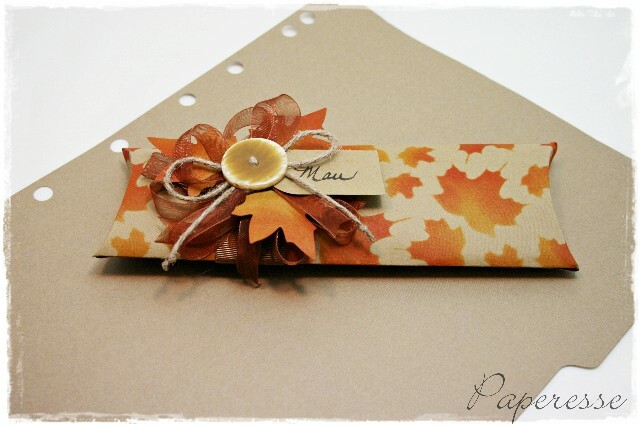 Paper – file divider. Existencil leaf stencil, Toga leaf die. Distress Inks – Orange Marmalade and Fired Brick. Embellishments - button, twine, ribbon.